Enterprise Zones are a powerful tool in developing the local economy, enabling Local Enterprise Partnerships to leverage local growth. Enterprise Zones allow the local area to retain a greater share of business rate income; offering discounted rates to new businesses locating in the zones, simplified planning rules and other support, such as enhanced broadband provision. 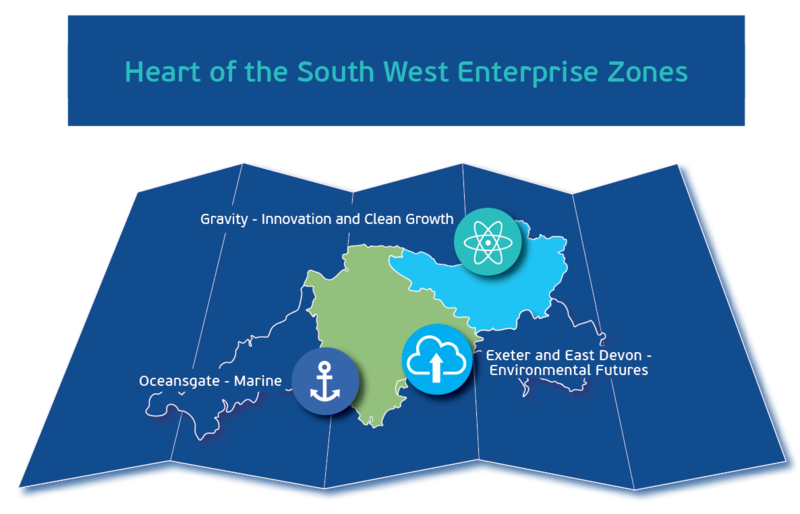 The Heart of the South West offers strategically sited Enterprise Zones across the area, which focus on some of the area’s strengths in key sectors: Nuclear and Low Carbon Energy, Marine, Environmental Futures, Advanced Manufacturing/Engineering and Food and Drink. The Enterprise Zone portfolio offers opportunities for investors in these key sectors, as well as being flexible to different sectors of businesses looking to take up opportunities for growth presented by strategic connectivity and favourable business rates. Enterprise Zones in the Heart of the South West are progressing well and are at various stages of development, with all of the Zones open for expressions of interest from developers and tenants. A two-centred, 177 hectare, multi-site Zone centred at the former ROF site near Bridgwater in Somerset and at Exeter and East Devon, which has four sites at Cranbrook Town Centre, Exeter Airport Business Park, Skypark and Exeter Science Park. The potential to support 17,800 new high value jobs over the next 25 years and an additional £320m in GVA to the UK economy by 2040. Gravity is a 635-acre site in Somerset which will be transformed into an innovation campus – a new era of enterprise zone. Gravity will be an immersive, connected, intelligent and sustainable environment that will attract some of the world’s most innovative businesses, drawing inward investment internationally and nationally. Purpose built, diverse workspaces and resilient technologies will be set against an established natural landscape – supporting a culture of innovation and well-being that blurs the boundaries between work and play. Gravity will be designed to shape connections between people and the places they work for a cleaner, sustainable future. The redeveloped site will create around 4000 new jobs and it anticipated the first tenant will be on site from mid-2020. For more information visit: Sedgemoor Enterprise Zone. The Exeter and East Devon Enterprise Zone has four sites, totalling 87 hectares, at Exeter Science Park, Skypark, Exeter Airport Business Park, and employment sites in Cranbrook Town Centre. The Zone complements the government’s investment in the new MET Office supercomputer, and is a catalyst for growth in environmental science and data analytics clusters. For more information visit: Exeter and East Devon Enterprise Zone. Oceansgate is a 35 hectare site at Devonport Dockyard in Plymouth. When completed it will be the largest commercial marine and maritime site in the UK, offering office and industrial buildings with deep water access. For more information visit: Oceansgate Enterprise Zone.